The Grand Ehiopian Renaissance Dam is edging closer to completion in Ethiopia, but not without ruffling a few feathers along the way, most notably, Egypt. Egyptian President Abdel-Fattah el-Sissi recently told reporters that, “we need to turn Ethiopia’s goodwill into formal agreements” and ensure the nearly completed Ethiopian dam is not used for “political purposes.” The general turned president did not elaborate, saying only that Egypt has seen “positive signs” from Ethiopia’s government during the process. Construction of the dam began in 2011 and is called the Grand Ethiopian Renaissance Dam (GERD). It was formally known as the Millennium Dam and during the planning stage was called Project X. It is considered Africa’s largest hydropower project and the 8th-largest in the world. Upon completion it will generate 6,000 megawatts of electricity and its reservoir will be able to hold over 70 billion cubic meters of water, which is nearly equal to the flow of the Nile river in one year. The dam is located in the Benishangul-Gumuz region of Ethiopia, on the Blue Nile River, to the east of Sudan. The project, a source of national pride for many Ethiopians, is owned by the Ethiopian Electric Power Corporation (EEPCO). In addition, Egypt’s Aswan High Dam and other dams in Ethiopia, “equates to around 19 billion cubic meters.” It’s estimated that the Ethiopian dam will reduce the capacity of the Aswan Dam, saving roughly six billion cubic meters of water. The impact on the region could be significant. Previous agreements about utilization of the river signed in 1929 and 1959 favored Egypt, which historically adopted an aggressive approach to the flow of the Nile River. According to conversation.com, “The first agreement was made between Great Britain, as the colonial power in eastern Africa, and Egypt. Cairo was favored over other riparian (situated on banks of Nile River) countries as an important agricultural asset. In addition, the Egyptian-run Suez Canal was vital for British imperial ambitions.” The British riparian colonies included: Sudan, Uganda, Kenya and Tanganyika (now Tanzania) as well as Ethiopia. They had no say in the outcome of the agreement. Cairo considers the Nile a national security matter and statements—though decreasing—continue to include threats of military action against Ethiopia should it interfere with the flow as set out in both agreements. After independence all the upstream riparian states argued in favor of a new, more inclusive legal framework for governing the Nile River Basin. They argued that they are not bound by these agreements because they were never parties to them. The 1959 agreement increased the two countries share of water, Egypt’s share to 55.5 billion cubic meters and Sudan’s to 18.5 billion. 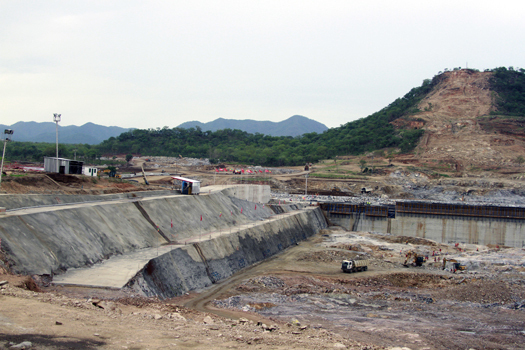 In April of 2011, then-prime minister of Ethiopia, Meles Zenawi, laid the foundation for the construction of the Grand Ethiopian Renaissance Dam. Shortly after the prime minister’s announcement, authorities in Cairo launched a campaign against what they said was an attempt by Addis Ababa to interfere with Egypt’s water rights. Egypt’s president at the time, Mohamed Morsi, angrily stated, while not “calling for war” with Ethiopia, that “Egypt’s water security cannot be violated at all.” He further stated, “all options are open,” and that Egyptians would not accept any projects on the Nile River that threatened their livelihood. The absurdity of this policy is mind boggling and only made sense under colonial rule, since roughly 85 percent of the water that flows into the Nile comes from the Ethiopian highlands through the Blue Nile. The remaining comes from the White Nile. Showing some willingness to play ball, Egypt, through President el-Sissi signed an agreement that included both Ethiopia and Sudan. “While it is true that Egyptians rely totally on the waters of the Nile River for all their needs, they must be sensitive to the development needs of the upstream riparian states, especially given the fact that the latter, particularly Ethiopia, are in a position to cause significant harm to the quantity and quality of water that flows into the Nile,” cautioned brookings.edu. Other challenges include: the Nile is shrinking due to less and more intermittent precipitation in Ethiopia and in other upstream countries, writes Salam Abdulqadir Abdulrahman, of the University of Human Development in Iraq. “In addition, Lake Victoria, the source of 20%-30% of the Nile waters, is shrinking at an alarming rate,” he added. But Ethiopia also has to consider Egypt’s water needs. According to analysis by the Washington Institute, the Nile’s flow will fall drastically during the new dam’s reservoir filling period, forcing Egypt to make up for these annual water losses. While it appears Egypt and Ethiopia are trying to find an amicable solution, the countries have not made much headway, notes the Washington Institute. The project is over 60 percent completed but the issue with the reservoir filling period is the biggest remaining issue and Egypt would like to prolong it as much as possible to lessen the annual decrease in Nile water supplies, the institute explains. Ethiopia recently appointed engineer Kifle Hora as the dam’s new project manager, according to Ethiopian Electric Power. Mr. Hora who will be signed on by engineers Ehpherem Woldekidan and Dekadu Kebede, replaces engineer Simegnew Bekele who was found dead in his car in Addis Ababa, in July. Mr. Bekele was the prominent face of the project. In addition to meeting Ethiopia’s energy needs, once the dam is completed it will also act as a driving force for exporting electricity to neighboring nations, which will prove crucial to generating foreign exchange. Those neighboring nations will include Sudan. According to Stratfor/Worldview, “The prospect of more electrical power effectively convinced Khartoum to switch sides from Cairo to Addis Ababa, inevitably infuriating Egypt.” Follow @jehronmuhammad on Twitter.